If you have any questions about the Lady Nina information page below please contact us. 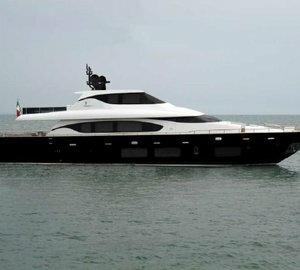 The 2012 motor yacht Lady Nina is the first Maiora 29 'convertible' vessel by Fipa Group. Lady Nina superyacht boasts the flybridge, which is not only open, like on every classic Maiora yacht for navigation in open air, but it can also be closed by a sliding glass to offer a special dining area. 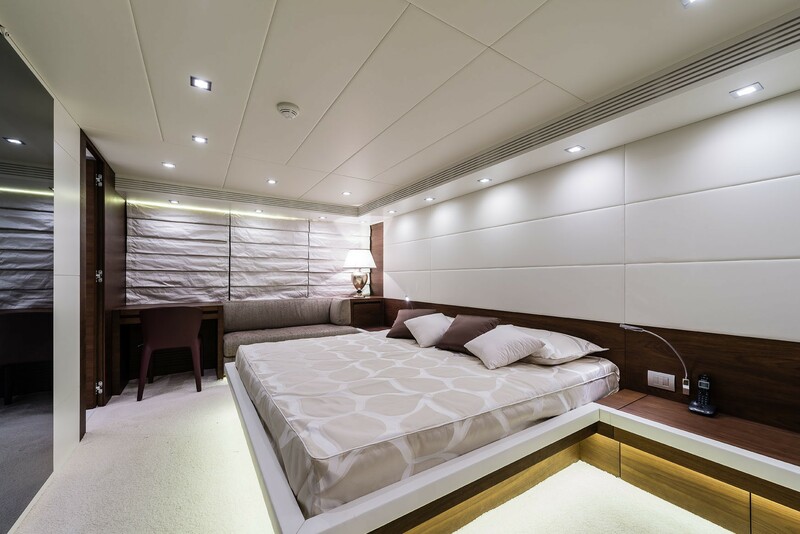 The maximum number of 9 guests are provided with the utmost in luxury aboard the Maiora 29 yacht Lady Nina. She features 4 lovely and comfortable cabins. All of these are located on the lower deck and they include a full-beam master cabin, a VIP cabin, a double cabin, a twin cabin plus a Pullman berth. 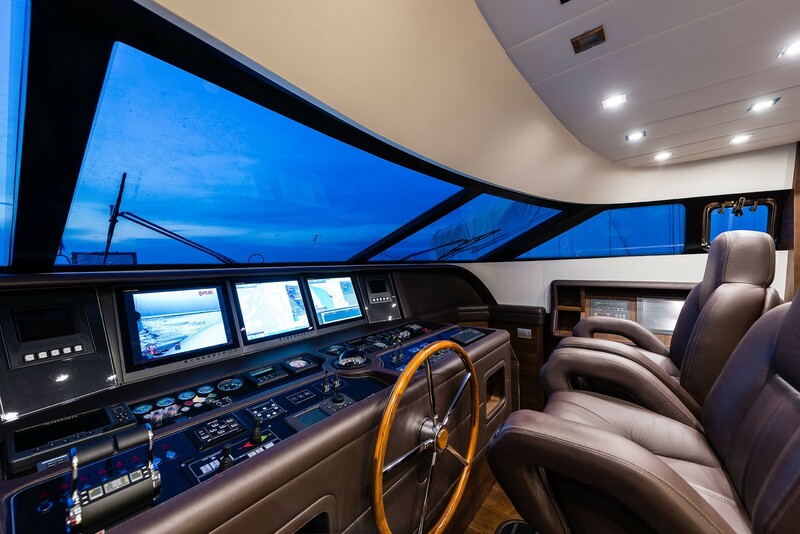 The saloon of the luxury yacht Lady Nina offers spacious sofas and a 70″ concealed TV. At its entrance, a day head can be found. She also boasts a huge sunbathing area, with access to an 'infinity pool' with a glass backside which gives the impression to swim while suspended in space. 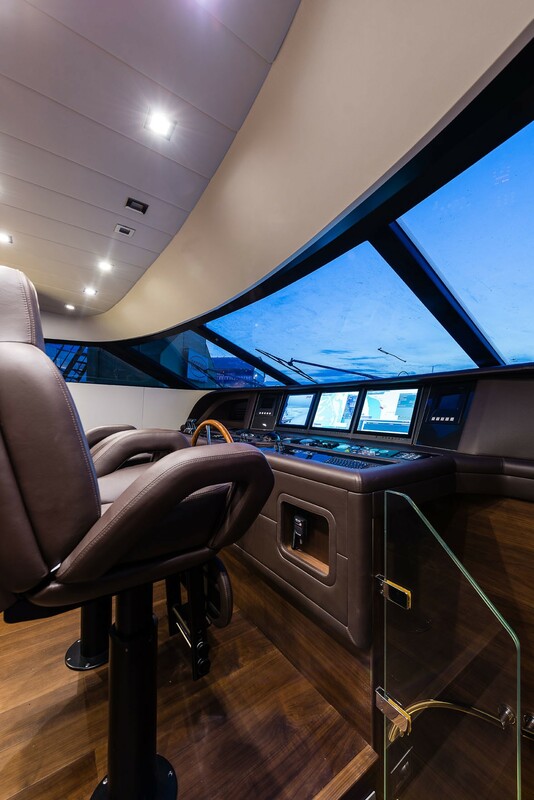 The cockpit of the vessel provides an impressive space capable of hosting 12 guests around the table, along with the sofa and lounge chair area. Lady Nina is also equipped with a 5-metre tender, which is stored in the stern garage. 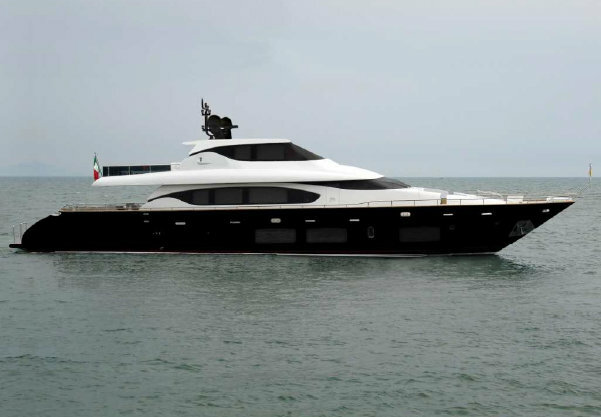 Twin MTU 16V 2000 M 94CR diesel engines drive the magnificent Lady Nina superyacht. She achieves a maximum speed of 32 knots and a cruising speed of 27 knots. Featuring a black hull and white superstructure, Lady Nina has a beam of 6.45m, while her draught is of 1,8m. Luxurious and comfortable accommodation aboard the Maiora 29 'Convertible' yacht Lady Nina is offered to up to 9 guests in 4 well apppointed cabins. All of these can be found on the lower deck. They include a full-beam master cabin, a VIP cabin, a double cabin, a twin cabin plus a Pullman berth. Lady Nina superyacht is fitted with a 5-metre tender, which is housed in the atern garage. The luxury yacht Lady Nina displayed on this page is merely informational and she is not necessarily available for yacht charter or for sale, nor is she represented or marketed in anyway by CharterWorld. This web page and the superyacht information contained herein is not contractual. All yacht specifications and informations are displayed in good faith but CharterWorld does not warrant or assume any legal liability or responsibility for the current accuracy, completeness, validity, or usefulness of any superyacht information and/or images displayed. All boat information is subject to change without prior notice and may not be current.